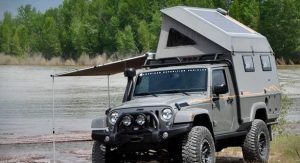 American Expedition Vehicles (AEV) has celebrated the end of Jeep Wrangler JK production by building a custom “overlanding camper” based on the popular off-roader. 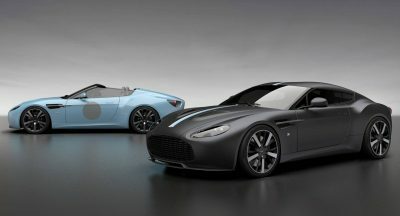 Billed as a “labor of love,” the Outpost II is effectively a bookend as the model follows in the footsteps of the original Output which was introduced in 2006. 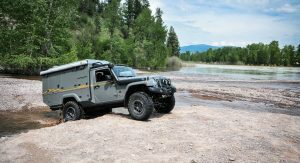 This, as you may recall, was the year the Wrangler JK first went into production. 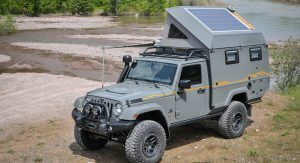 Based on the Wrangler Unlimited, the Outpost II has a familiar design but everything aft of the front doors is unique to the model. 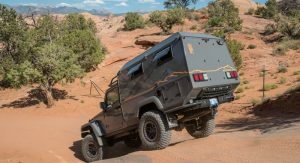 As AEV explained, the wheelbase remains stock but they extended the frame – behind the rear axle – to create room for the camper and an underbody spare tire. 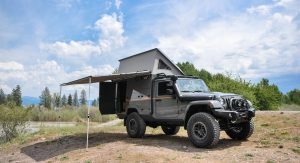 From there, the company built a steel “birdcage” to support the weight of the fiberglass camper which features an electrically actuated roof with custom hinges inspired by those on the Jeep’s hood. 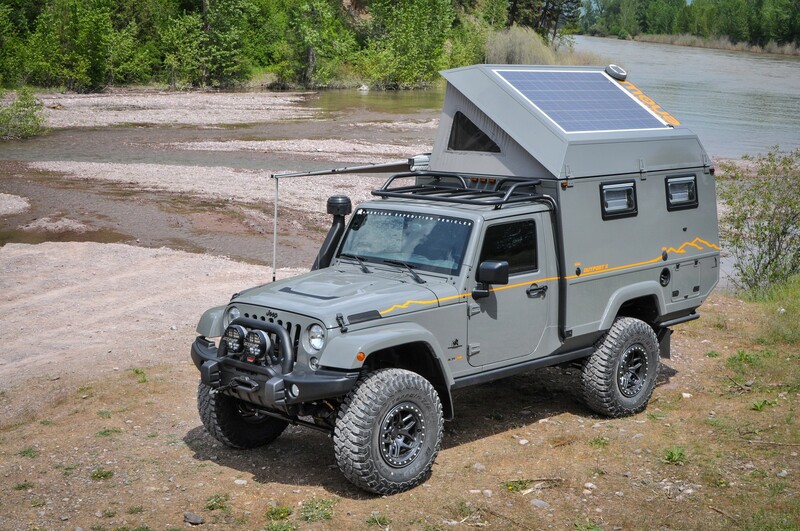 Speaking of the roof, it has been equipped with an integrated solar panel which provides electricity for both the camper and the Jeep’s battery. 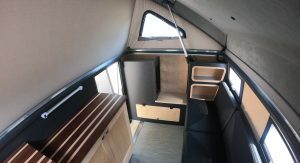 While the camper isn’t very spacious, it features a handful of cabinets and an 80 inch (2032 mm) long couch that doubles as a bed. 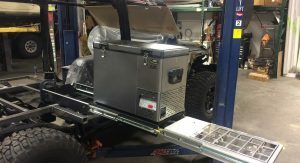 A number of components are hidden underneath the couch including a 22 gallon (83.2 liter) fresh water tank, a water heater, an air compressor and a 13,000 BTU central heater. 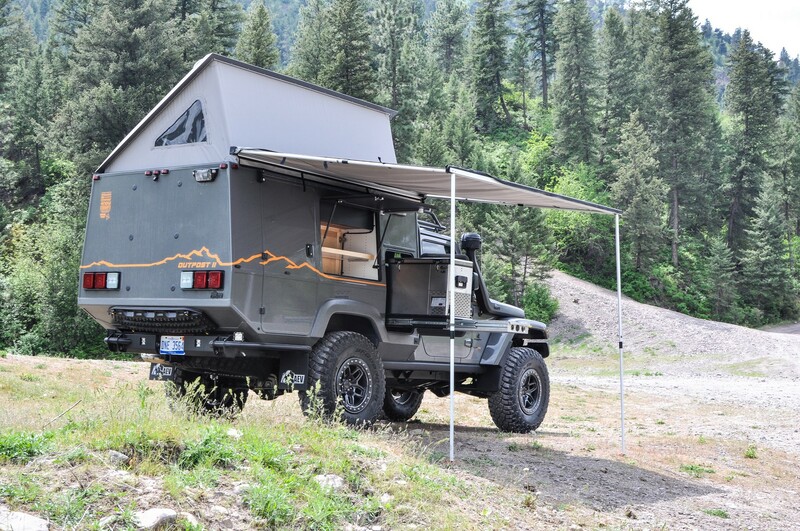 Since the camper adds approximately 750 lbs (340 kg) of weight to the vehicle, AEV beefed up the suspension by adding a custom rear sway bar and one of their 4.5-inch JK DualSport suspension systems with high capacity springs. 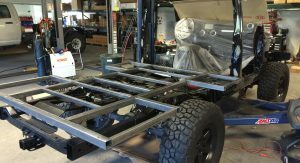 The model also has Dynatrac ProRock 44 and ProRock 60 axles with lockers and a big brake kit. 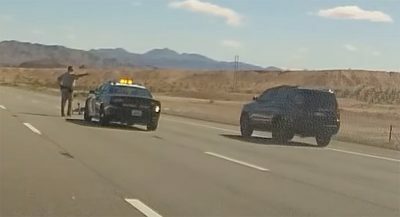 The performance upgrades don’t stop there as the JK’s 3.6-liter V6 engine has been replaced by a 5.7-liter HEMI V8. 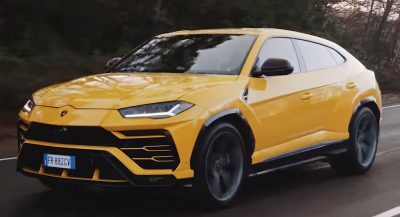 The company didn’t mention performance specifications, but the engine breathes through an AEV snorkel and a special air box. 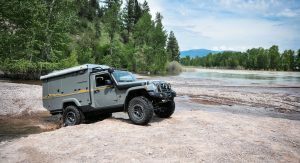 The Outpost II has also been equipped with an AEV premium front bumper, a Warn Zeon 10.0 winch and 17-inch wheels wrapped in BFGoodrich KM3 Mud-Terrain tires. 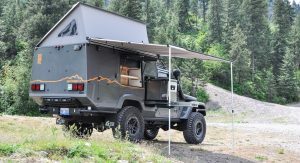 Rounding out the highlights are a custom awning, stability jacks and a motion-sensing LED exterior lighting system. 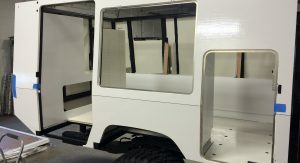 AEV says the Output II is simply a concept and there are no plans for production. 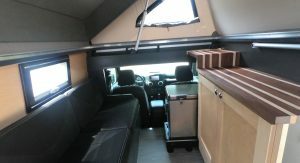 That’s unfortunate, but AEV CEO Dave Harriton is using it as his mobile office and he considers it a work in progress as he still wants to add a sink and an outdoor shower. 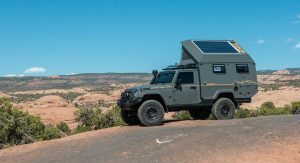 A Unimog for the plebs?